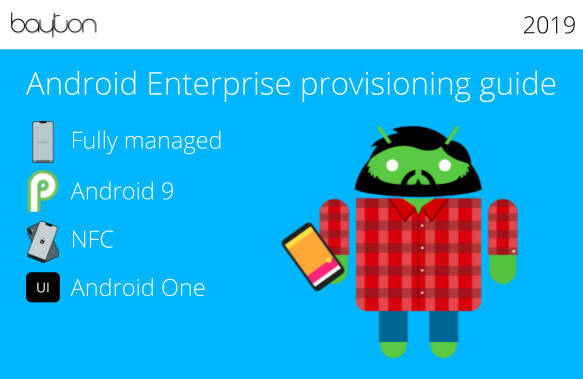 For information regarding Android Enterprise, including what it is, the deployment scenarios stated below and how it can benefit organisations, have a read of What is Android Enterprise and why is it used? The following guides have been created for reference purposes only. As individual environments differ, some aspects may not be relevant and others may not be present. The Android version used in each guide is indicated underneath the title; this does not reflect the minimum version required for the features described in each guide, but rather the OS version the guide was undertaken against as screenshots and workflow can vary slightly between major OS versions. Bespoke, white-label documentation can be provided on request. Use the contact page for enquiries. If you notice any issues with these guides – typos, incorrect steps, etc, please leave a comment below, tweet me @jasonbayton or use the contact page to send me a message. The same applies if you’d like to discuss any other aspects of the guides or Android Enterprise in general! Reference guide(s) for legacy enrolment, enabling direct comparison with Android Enterprise enrolment documented above. how do we get dpc_identifier ? Could you please explain steps to get it ? Your EMM should provide you with the DPC identifier, some examples are in the link above however speaking to your support contacts will get you the one you need. Thanks for the quick response, how does EMM provider gets the DPC identifier? do we have any EMM API to create DPC identifier? That’d require a conversation with Google, as the DPC identifier is generated with them to pull the configuration for a particular DPC from the Play Store during enrolment. Conversation as in request for DPC identifier for EMM ? Yes. If you’re an end-user looking for the DPC identifier for the EMM your company uses, speak to the EMM vendor. If you’re an EMM vendor looking to support DPC identifier enrolment, you’ll need to reach out to Google to have this set up.